Westfall begins with Greco-Roman views of gender in ch. 1, which includes patronage, honor and shame, and the domestic spheres of women in the ancient world, concluding with an extended exploration of “head” (kephalē) and the “veil” in 1 Cor 11:2-16. Regarding the veil, she posits that it was not a symbol of submission; rather, “Paul’s direction for all women to veil was countercultural and favorable toward women” (43). Contrary to some recent arguments, Westfall concludes that Paul is referencing a veil as opposed to hair, although she does not see the two as mutually exclusive. She concludes that Paul’s multifaceted and contested use of “head” in 1 Cor 11 ought to be understood as “source” in 11:3, in relation to kinship, “where it will refer to a parent or ancestor/progenitor” (40), as it does in Philo’s On the Preliminary Studies. This understanding fits well with the broader context of 1 Cor 11, for the reciprocal nature of the source metaphor comes to fruition as both genders are taken from one another (vv. 7-9, 11-12). Chapter 2 concerns gender stereotypes and the depth of Paul’s use of metaphors which apply to all believers, such as describing Christians as spiritual warriors, athletes, or the bride of Christ. Paul’s general disregard for social conventions is significant in his use of metaphors, especially when applying feminine metaphors to men. For instance, a man’s depiction as “Christ’s bride” (58-59) in Eph 5 “reverses the shame that was directly connected with the female’s sexual function in the Greco-Roman culture” (59). Chapter 3 delves into the creation narratives, and Westfall pays special attention to how “image” functions in Pauline perspective. She challenges complementarian scholars, such as Thomas Schreiner, when she writes, “there should be no a priori assumptions that any Pauline command, prohibition, or instruction supported by the creation account is a ‘transcendent norm’ (or a universal conclusion) as opposed to an occasional or culturally bound application” (62). Though Paul sometimes mentions the temporal priority of Adam (1 Cor 11:7, 1 Tim 2:13-14), one cannot immediately codify temporal priority with “normative or universal conclusions” (62-63). Westfall convincingly demonstrates that 1 Cor 11:7 and 1 Tim 2:13 are focused on the fact that “the creation of woman from man evens out the balance” (72-73). She also argues—contra Schreiner and others—that Paul’s statements about temporal priority are not propositional, but are narrative summaries (77). She includes a sophisticated exploration of “head” (79-84) in relation to creation and “source,” concluding: “One way that kephalē occurs distinctively is in language used for family, paternity, and ancestry” (82). When kephalē is coupled with “body” (sōma), the likelihood that Paul is using “head” to mean “source” becomes quite probable, especially in relation to the head/body metaphors in Colossians and Ephesians. Chapter 4 focuses on Paul’s interpretation of the fall and how it impacts gender relationships. Westfall rightly points out that “deception” is not limited to a specific gender and argues, “Even though Eve was a woman, according to Paul the possibility of being tempted or deceived by Satan or sin is a universal experience” (111). The sixth chapter is centered on the Pauline concept of “calling.” Rather than beginning with 1 Cor 12-14, Westfall instead offers an extended exegesis of Rom 12:1-8 (though other texts are covered). Referencing John Piper’s discernment that he should become a pastor, Westfall forcefully responds: “When a man negotiates his call to ministry, he utilizes emotions and experience in accordance with his faith and the grace that he is given. . . . A woman is often told that it is invalid for her to utilize experience and emotions in discovering her call, since she may come up with the ‘wrong’ conclusion” (214). This chapter concludes with an extended and contextually-aware exegesis of 1 Cor 14:34-35. Following Payne and Gordon Fee, she views the theory that these verses were inserted by a scribe long after Paul composed the letter as “convincingly argued” (228 n. 63), though she also subjects the passage to an analysis that includes these two contested verses. She believes that the context of 1 Cor 14 (and the entire epistle) is not about “public worship” in the modern sense, but takes place “within the woman’s sphere of influence and responsibility” (230)—namely, the house church. Westfall concludes that, if original, vv. 34-35 focus not on an absolute ban on women speaking, but rather being “quiet and self-controlled” (241). Westfall has offered those who affirm the originality of vv. 34-35 a way to interpret this difficult text that does not exclude women from answering their God-given call to ministerial service. The seventh chapter focuses on authority and includes a helpful survey of Greco-Roman cultural views of authority—specifically, the variety of ways women functioned in the domestic sphere and how they wielded power. Westfall does not limit herself to how women used authority, for she notes how men brandished authority as well. The final chapter is an in-depth exegesis of 1 Tim 2:1-15, often noted as the key proof text that excludes women from teaching or assuming authority over men. Several of her arguments stand out. First, Westfall sees 1 Tim 2:8-15 as concerned with the household or domestic sphere rather than a public setting (311). Second, she believes the use of “wife/woman” (gunē) throughout vv. 8-15 adds further evidence that Paul has a wife and husband in view rather than men and women in general, and thus he is putting a stop to an abusive relationship (cf. the marital mutuality of 1 Cor 7:3-4). Third, Westfall notes, “Paul uses the word authenteō [“assume/usurp authority”] to criticize the behavior of wives toward their husbands in a case of role reversal, where the woman would assume an authority that may be comparable to a paterfamilias and behave in an abusive or controlling manner” (293). She also perceptively highlights the role of the false teachers in Ephesus, which helps to clarify and contextualize Paul’s temporary prohibition (296-97). She finally concludes that, “Rather than prohibiting women from participating as leaders in the church, Paul addresses the . . . [lack of] discipleship that is holding the Ephesian women believers back from maturity and sound teaching” (311-12). There is much to commend in Westfall’s book. She has offered a comprehensive, thematic, and coherent reading of Paul that is far from limited to a relatively small number of highly contested verses. Westfall’s capacity to interpret scripture with sophistication is on display, especially in Rom 12:1-8. Her arguments based on the necessity of “experience” and “emotions” cannot be dismissed, especially when placed in the light of male preachers who highlight these same factors in discerning their calling to ministry. Her reading of 1 Cor 14:26-40, including her analysis which includes the contested verses, is especially helpful. Her exegesis of Gal 3:28 in context firmly rebuts the complementarian reading that the verse is restricted to an affirmation of who can be saved, and her work on Paul’s use of the creation narratives helpfully contextualizes a lingering question some egalitarians may have. Throughout the work, Westfall is spirited, scholarly, and deeply charitable to those who might disagree—although she rightly leaves them little room for disagreement! While there are no discernable shortcomings to Westfall’s book, there are some lingering questions. While the notion of “authority over” is likely not present in Eph 5 (“the husband is the head of the wife . . .”) one can see the idea of “preeminence” at play concerning that vexatious word “head” (kephalē). Would Westfall see the notion of “preeminence” as a further continuation of role reversal and mutual submission, insofar as the husband has more to sacrifice as the preeminent one? Does the husband retain the titular concept of “preeminent” in a social context, but forsake the rights that come with such a title? A second possible question arises from 1 Tim 2:15 and its mention of “the childbirth” (teknogonia): the view that this refers to the birth of Christ is largely ignored. In the Pastoral Epistles, where Christ is said to be a mediator (1 Tim 2:5) and also called God (Titus 2:13), one wonders how the question of Paul’s close contextual Christology could enhance Westfall’s analysis of 1 Tim 2:15. The narrative of Christ as a “ransom” (1 Tim 2:6) might offer additional support for this Christological interpretation of 2:15. A chapter dedicated to Pauline Christology and perhaps the relationship between Christ, Adam, and gender would have been additionally welcome. Nevertheless, Westfall’s analysis does not falter because of these questions. Rather, we are encouraged to further explore the complex realities of our beloved Apostle. In summation, Westfall’s book does not offer the church merely an egalitarian reading of a few isolated texts. 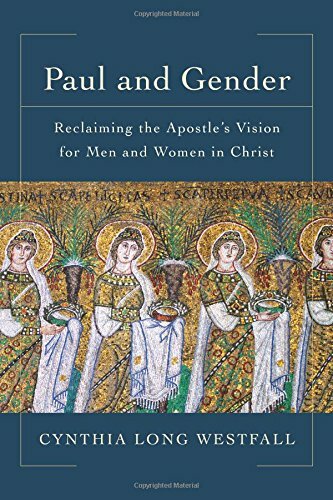 Instead, she paints a broad and coherent mosaic that will force complementarians to grapple not only with her judicious exegesis of the relevant texts, but also with the reality that the totality of Paul’s theology supports women in ministry. Paul, as Westfall has amply established, is more than the sum of a few verses; indeed, Paul is the apostle not just to men, but also to women. On a personal note, I suggested this book to a pastor friend whose church is debating whether to ordain women as pastors. While the debate in that church has continued unabated, my friend has since become convinced by Westfall’s work. It seems he has “found a reason to believe,” and to that end, Westfall’s splendid work has already been life changing indeed. 1. Philip B. Payne, Man and Woman, One in Christ: An Exegetical and Theological Study of Paul’s Letters (Grand Rapids: Zondervan, 2009); Craig S. Keener, Paul, Women, and Wives: Marriage and Women’s Ministry in the Letters of Paul (Grand Rapids: Baker Academic, 1992). Nicholas Quient is a graduate of Saddleback College and Biola University and is currently an MAT student at Fuller Theological Seminary in biblical languages. He loves his wife Allison (a PhD student at Fuller Theological Seminary), his blind cat Monty, dark beer, and bottled Coca-Cola.